Raw this could be summed up in two storylines, firstly WWE Champion John Cena and Daniel Bryan has been seemingly out of control with Vince McMahon, Triple H, Stephanie McMahon, Randy Orton and now The Shield all added to the story when they weren’t really needed to help sell the match at SummerSlam. Meanwhile CM Punk and Brock Lesnar continue to have a logical and well built storyline that has grown organically over the last two months. So whilst part of Raw seemingly has a crazed computer writing it, the other part feels like it has been hand-crafted by a wrestling genius. We kicked off Raw this week with Stephanie McMahon presenting a video showing Daniel Bryan’s “corporate makeover”. What followed was comedic skit of Bryan having his hair done, lifting weights, getting a suit and eating meat. It wasn’t that the segment was particularly awful and would have it’s place somewhere further down the card, but to build to a SummerSlam main event, definitely not. Bryan attempted to rescue the segment with a great promo on why he will beat John Cena at SummerSlam, even mentioning the word “Wrestler”. It comes to something when the word that describes the company’s employees gets a pop from the crowd. It then went back down hill, with WWE Chairman Vince McMahon heading to the ring. Whilst I’m happy to see Vince back as a heel, I just don’t understand the need for his involvement here. He asked Bryan to shave his beard, and a reluctant Bryan seemed to agree sitting in a barber’s chair. Vince brought out Wade Barrett to do the honours, seemingly forgetting Barrett’s vicious attack on him in 2010. Bryan got the upperhand on Barrett with some hard punches eventually shaving part of Barrett’s beard. What Wade Barrett had to do with proceedings I don’t know and despite all of Bryan’s attempts this really was a terrible opening segment to Raw. Later in the night, WWE Champion John Cena came out to respond to Daniel Bryan’s comments. Cena did cut a very strong promo, even if the Green Bay crowd chanted boring, and to me it felt like a heel promo. Cena cut into Bryan for his work on the independent scene, claiming that Bryan would much rather be there. Whilst that probably doesn’t mean a lot to Cena’s key fan base, it does to key areas of WWE’s viewership and therefore Cena seems to be aiming his heel promos towards them, really selling his corporate image, which makes it even more bizarre that Vince doesn’t want him as WWE Champion (apparently). Cena was interrupted by WWE Championship Money in the Bank Winner Randy Orton, reminding Cena that he held the briefcase and he would cash in when he wanted. The interuptions continued with The Shield heading down to the ring, but as United States Champion Dean Ambrose, and Tag Team Champions Seth Rollins and Roman Reigns circled the ring, Daniel Bryan came down to even the numbers. It was then that Raw General Manager Brad Maddox made his presence known, pulling a Teddy Long and setting up a six man tag team match for the main event. Before the match, we had some truly awful acting from Stephanie McMahon complaining that her Dad had shouted at her for the “Corporate Makeover” segment, which seemed odd to me. Vince McMahon runs the show, he knew the segment was terrible but still ran it? WWE COO Triple H said he would sort things out with Vince. 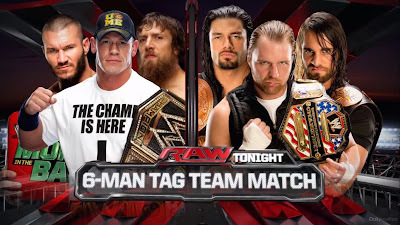 The match itself was actually pretty disappointing, whilst the action in the ring was good, it certainly wasn’t long enough to constitute a television main event, and didn’t really hold up to the numerous other six man tags we’ve seen over the last year. The ending was even more disappointing as with Bryan locking in the No Lock on Seth Rollins, only for Ambrose and Reigns broke it up, which somehow leader to a disqualification. I don’t remember that ever being part of the rules of professional wrestling and have never seen WWE enforce the rule before! The brawl that ensued saw Cena and Bryan get the upperhand, causing The Shield to retract. With Bryan celebrating Orton entered the ring and hit his partner with an RKO. With Orton and Cena seeing off another attack from the Shield, it gave Orton another opportunity to hit the RKO this time on the WWE Champion. If attacking to top two faces in WWE at the moment, doesn’t count as a heel turn I don’t know what does. With Orton getting his briefcase, it looked like he might cash in and win the WWE Championship. What worked well for me here was that I knew Orton wouldn’t be cashing in, but still somehow believed he would. That was until The Shield came back down to the ring and Orton left the arena, leaving Bryan and Cena to the mercy of The Hounds of Justice. Now, whilst closing stages of the show were fairly exciting, I’m not sure exactly what it did for Cena and Bryan at SummerSlam which should surely be the main focus. With this build-up it would seem the old saying is correct, too many cooks spoil the broth. Before CM Punk’s match with Intercontinental Champion Curtis Axel, Josh Matthews caught up with Punk backstage. Punk gave a very good interview, building up his match with Axel, as he compared Axel’s relationship with Paul Heyman, to Axel’s father Mr Perfect’s relationship with Bobby Heenan. Punk also put over his match with Brock Lesnar at SummerSlam well reminding people that unlike Paul Heyman, Punk is a man of his word. Punk is clearly one of the best in WWE on a microphone, and this type of interview seems like a walk in the park to him, as he presented a well structured and meaningful promo, that set up not just one, but two matches. Punk wasted no time attempting to go after Paul Heyman, with Axel cutting him off at the pass. It was a great start to the bout and really sold the hatred Punk now has for Heyman, as well as the loyalty of Axel, who this bout did the world of good as he went toe to toe with Punk. Personally, I think this is probably the best match we’ve seen from Axel in WWE so far, as Punk’s intensity really made Axel up his game. The match featured an interesting psycology with Punk attempting to get at Heyman throughout the match, only to be thwarted by the Intercontinental Champion. The crowd’s “This is Awesome” chants may have been a little unjustified, but it was still very strong for eight minutes of television time. The end of the match, saw Axel attempting to get advice from his manager, only for Punk to push Axel out of the way and grab Heyman. For the second time in the night the referee bizarrely called for the bell, I’m pretty sure WWE have forgotten their own rules, I’ve never seen someone get disqualified for attacking a manager before! Apart from that this worked as an ending to the match, as Punk had never seemed like he was trying to beat Axel, just beat him up bad enough to get at Heyman, which after the actions of Heyman towards Punk over recent weeks was a believable reaction for Punk to have here. Of course, the Beast Incarnate, Brock Lesnar choose this moment to make his return to Raw after three weeks to confront Punk once again. This battle was as good as their first show down, with Punk once again holding his own, using kicks, elbows and the steel ring post to get an upperhand. That was until Lesnar hit a vicious Release Belly to Belly suplex on the outside, and after Punk teased a brief comeback, an F5 to leave Punk laying. These confrontation have really helped to sell the Punk vs. Lesnar match at SummerSlam (like it needed selling) giving the fans a taster of what’s in store, and allowing Punk to come across as a arsekicking underdog, a roll that we haven’t really seen WWE delve into. Afterwards, Renee Young interviewed Heyman and Lesnar with Axel in the background. Whilst Lesnar’s promo served as a reminder to why he needs Paul Heyman, Heyman was strong setting up a match between he and Punk next week on Raw. Now, it’s pretty clear that Punk won’t get much time alone with Heyman, but the concept is still a good one and hopefully we’ll get to see Punk and Lesnar class on more time before SummerSlam. The other big match on Raw this week saw World Heavyweight Champion Alberto Del Rio face off against Rob Van Dam, in a return match from Smackdown two weeks ago. I was happy to see a rematch between the two as the Smackdown match was looking promising until it ended incredibly quickly with a superkick from Del Rio allowing him to pick up the victory. I was also wondering how the dynamic between the two would play out after Van Dam had lost a number one contenders match on Smackdown to Christian. Surely, WWE had to make Del Rio look strong after suffering defeats to Christian and Randy Orton in the last month, with Van Dam yet to get an opponent for SummerSlam. Before the match, it was announced that Del Rio’s personal ring announcer Ricardo Rodriguez would be returning, after a 30 day suspension (or injury in storyline terms) as he announced Del Rio to the ring. I was disappointed by the contest, with Van Dam and Del Rio putting on a strong television contest. I’ve been impressed with Van Dam since his WWE return, as he’s looked a lot more competent than he did during his TNA run, granted he only really performs when the crowd gets behind him but once they are the matches he’s been having had been good to watch. Del Rio is another person I’ve been impressed with recently, even if his win/loss record hasn’t been particularly strong, his matches have been consistently good. A lot of people don’t seem to enjoy Del Rio’s work but in his current role I think he’s done a strong job. The ending of the match saw Rodriguez attempt to get involve, by placing his trusty bucket in the corner, only for Van Dam to reverse Del Rio’s irish whip attempt, sending the World Heavyweight Champion crashing into the rather flimsy looking bucket, allowing for Van Dam to score the victory with a leg trap roll up. I wasn’t happy to see Del Rio lose here, as although the loss was to set up an angle between Del Rio and Rodriguez, the amount of matches that Del Rio has lost in the last month is beginning to get a bit silly. He is supposed to be the World Heavyweight Champion and shouldn’t really be losing every match he is, it diminishes the title and means that whoever is next to win that title hasn’t really achieved much anyway. After the bout Del Rio launched into a vicious attack on Rodriguez. At first Del Rio used the bucket, which to be honest didn’t look to be hurting Ricardo at all, because it was so flimsy. They did their best with the bucket with Del Rio really swinging hard and Ricardo selling for his life, but still it looked a bit silly. Luckily, Del Rio upped his game, sandwiching Ricardo’s head between the steel steps and the ring post, hitting a front kick on the steps, which was visually impressive. It looks like we’ve seen the end of the partnership between Del Rio and Rodriguez, and although some have mourned the loss of this once strong partnership, I for one am happy to see it end. In recent weeks when Del Rio was without Rodriguez, I didn’t really notice he was gone and Del Rio seemed all the better for it. Ricardo is just too likable in his role, and the crowd love joining in with as he says Del Rio’s name. I wouldn’t be too surprised if Ricardo get’s involved with Del Rio’s match with Christian at SummerSlam. Elsewhere on Raw this week, The Wyatt Family’s Luke Harper and Erick Rowan were in action against Tons of Funk, in a rematch from this past week’s Smackdown. Whilst Brodus Clay and Tensai were more competitive than Friday night, it still didn’t take Harper and Rowan long to dispatch of Tons of Funk, after a discuss lariat from Harper and Running Splash from Rowan got the Wyatt Family the pinfall victory. I quite like the contrast between the dancing of Tons of Funk and the dark portrayal of the Wyatt Family giving an extra edge to these squash matches. It would be nice to see Tons of Funk break out of the dancing gimmick and run as a monster tag team, as when Brodus and Tensai get enough time to perform they do usually deliver. After the match, Bray Wyatt took out Brodus Clay with Sister Abigail and cut another impressively creepy promo encouraging Kane to follow the buzzards. Just when it looked like the segment was over, fire erupted from the stage and Kane appeared on screen. Kane cut an even creepier promo and it was great to see the Devil’s Favourite Demon side of the character return after a long time. A SummerSlam match between the two was finally set up, with Kane referencing a “Ring of Fire”, surely we will see the return of the Inferno Match at SummerSlam. With Wyatt not afraid of Kane’s fire, seemingly enjoying it, this set’s up for a rather intriguing bout between the two in two weeks’ time. Cody Rhodes also made an appearance on this week’s Raw, presenting a highlight package of what had happened two weeks previously on Smackdown, when Rhodes threw Damien Sandow’s World Heavyweight Championship Money in the Bank briefcase into the Gulf of Mexico. Rhodes also presented Sandow with the recovered briefcase, which in classic WWE style was covering in seaweed and dripping wet. Rhodes left the briefcase in the ring, but once Sandow got his hands on it, Cody jumped him and the two brawled it out in the ring. With Sandow escaping Rhodes took the contract from the briefcase to end the segment. I don’t quite understand what this meant in terms of Sandow’s World Heavyweight Championship match and it certainly wasn’t made clear enough by either the wrestlers or the commentators what was supposed to have happened. Despite the slightly goofy element of the segment and unclear nature of the ending, it certainly hasn’t dampened my anticipation for Rhodes vs. Sandow at SummerSlam as I think given the time the two will have a fantastic match. The build has been a little dodgy, with some hit and miss segments, but the overall idea has been established well. I do wonder however if Cody Rhodes can continue as face after this rivalry is over, he will need a lot more development as a character to do so, or he could end up going the way of Alberto Del Rio’s early 2013 face run, that only worked against Jack Swagger and Zeb Colter. New Number One Contender to the World Heavyweight Championship Christian was also in action this week as he faced off against 3MB’s Heath Slater. After some antics from Jinder Mahal and Drew McIntyre gave Slater the advantage, it didn’t take long for Christian to turn things around picking up a quick pinfall victory with a Spear. For what it was this was a decent match, but didn’t really do much for Christian as he looks to gain momentum heading into SummerSlam. Christian could have done with a victory over a name higher up the card on Raw, or at least some involvement with Alberto Del Rio, because as it stands Christian and Del Rio’s SummerSlam match looks like the weak link on the card. Dolph Ziggler’s rivalry with Big E Langston also continued this week as the two faced off in the ring. For me this match didn’t quite live up to expectation with Ziggler and Langston not quite gelling in the ring. At times Langston looked awkward when both delivering and receiving moves, which certainly detracted from the match. Kaitlyn went on to get involved in the contest by attacking Langston’s manager Diva’s Champion AJ Lee and the two brawled into the ring. The intensity of the brawl wasn’t something that you see out of every woman in WWE and it allowed me to overlook that this rivalry looked dead in the water at Money in the Bank. Even with Kaitlyn and AJ brawling in the ring, the match somehow continued, with Langston taking the opportunity to hit Ziggler with the Big Ending at pick up the victory and for the first part of the match Langston actually looked fairly impressive. It would seem that a mixed tag team match is on the cards for SummerSlam. Kofi Kingston also returned to WWE, making his first appearance in over two months, as he faced off against Fandango, who was accompanied by Summer Rae. Kingston doesn’t seem to have missed a beat, as he pulled off a decent short television contest without much effort. Fandango did manage to botch a spinning heel kick which was the only real blemish on this short bout. The ending saw Kingston miss a Trouble in Paradise, only to manage to pull out another one soon after to pull off the victory. Kingston seems to have slotted straight back into his role as the face of the mid-card, and he does play his role extremely well, but I’m beginning to wonder if it might be time for Kingston to change up his character a bit to keep things fresh, a strong story and feud would certainly help this. The women’s action this week came in the form of Kaitlyn facing off against former friend Layla, who had betrayed her on Smackdown. Layla dominated the majority of the match and looked awkward in doing so, with some bizarre antics like clinging to the top rope, not paying off because of sloppiness. With Kaitlyn turning the tide, Diva’s Champion AJ Lee made an appearance to distract Kaitlyn, with Layla able to get the victory with a Bombshell kick, before Lee and Layla (or LayJ) skipped around the ring. Whilst, Layla was sloppy in the ring, she is certainly a lot more comfortable as a heel, and hopefully once she get’s used to the mindset of a heel during matches again, she’ll be a much better addition to the story. There was also tag team action this week as The Real Americans, managed by Zeb Colter, had a rematch with The Usos. After Zeb Colter resorted to insulting American Football teams for heat, showing how far that character has come, the match that followed was solid piece of tag team action, with good input from all four competitors. With Antonio Cesaro and Jack Swagger doing a good job of working over The Usos for most of the match, using their power game to their advantage, The Real Americans looked pretty impressive. After the hot tag and a few near falls for The Usos, the match brokedown with Jack Swagger being taken out by a diving Uso, before Swagger gained an upperhand sending his opponent into the ringpost. Swagger and Cesaro then had a chance to double team the other Uso, with Cesaro hitting the Neutralizer to pick up a pinfall victory for his team. Whilst The Usos push seems to be over for now, I really can’t see where The Real Americans are going to go as a team, with The Shield and The Wyatt Family both above them in the heel tag team hierarchy their isn’t much room for upward movement at the moment. In a Wrestlemania XXIX rematch, Mark Henry faced off against Ryback. With the two having swapped face and heel roles since then I was interested to see how the dynamic would be changed in this. Unfortunately, I didn’t get much chance to see, with Ryback walking out on the match pretty earlier on. I wasn’t quite sure what the point of the whole segment was, as with both of these big names still looking for a SummerSlam opponent this was essentially treading water and did nothing for neither man. Mark Henry’s feud with The Shield seems to have been dropped with little mention of it here, whilst Ryback is currently in storyline no man’s land. WWE also found time to promote Total Divas, with a truly abysmal segment featuring The Bella Twins, Eva Marie and Natalya. The Bellas wound up Natalya over last week’s loss to Brie and the infamous “quack, quack, Nattie” ending. Natalya eventually slapped Brie in the face, delivering the only convincing line of the entire segment, the only thing good thing I can see coming out of these backstage skits, is that Natalya is given more ring time and a push, she would be a perfect candidate to face AJ Lee for the Diva’s Title down the line. The funny thing about this segment is that, the actual show it was trying to promote, Total Divas, is so much better than the segment itself. What did I learn from Raw this week? 1. Daniel Bryan and John Cena's good work in building up their SummerSlam match is getting lost in the sea of other personalities being thrown into the story. 2. Brock Lesnar and CM Punk is benefiting from keeping things simple. 3. The World Heavyweight Championship has become a huge after thought leading into SummerSlam.